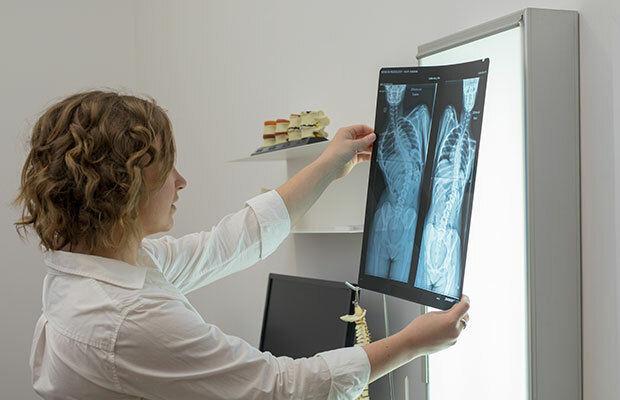 At Health First Chiropractic we offer scoliosis screening and assessment to guide treatment that is best suited to you and the stage of your scoliosis. Chiropractors at Health First Chiropractic are capably placed to diagnose scoliosis and in some cases, manage scoliosis depending on the type and severity. Our practitioners have a special interest in scoliosis management and have completed additional postgraduate education in the non surgical treatment of scoliosis, through scoliosis specific exercise and rehabilitation. Scoliosis can lead to poor posture, muscle weakness, pain and discomfort and, in rare cases, heart and lung problems. If left untreated, scoliosis can progress and sometimes may require surgery. It’s not uncommon for people to come to us to seek information about how to treat scoliosis without surgery. At Health First Chiropractic we believe it is never too early to treat scoliosis. If scoliosis is detected early there is better scope for treatment. Non surgical treatments often have a positive result when the scoliosis is detected early and patients are managed correctly. Our scoliosis treatment and management approach uses a combination of traditional chiropractic care to aid in the management of symptoms associated with scoliosis and a physical therapy approach in specific scoliosis exercises and rehabilitation designed to address the scoliosis curve. We acknowledge that the use of traditional chiropractic approaches to scoliosis alone, including spinal manipulation therapy and/or general exercise, cannot correct or cure scoliosis or prevent progression of idiopathic scoliosis. These treatments may however help things such as pain or flexibility. These techniques are often encouraged if they help you deal with scoliosis related pain, posture or mobility issues. When considering early intervention designed to address the scoliosis curve itself, we recognise only specialised scoliosis rehabilitation and exercise programs that are specifically designed to treat scoliosis, have been shown to be helpful in reducing the risk of progression for different types of curves. As such, Health First Chiropractic has a dedicated scoliosis practitioner, Dr Ella Bourne, who has received advanced training and accreditation in the evidence based scoliosis rehabilitation and exercise program known as SEAS (Scientific Exercise Approach to Scoliosis). It is currently the most known, researched and widely used rehabilitation approach to treating scoliosis and has been used for more than twenty years. Our trusted chiropractors have the training and skills required to accurately assess, diagnose and guide treatment based on what is best suited to the patient and your stage and type of scoliosis. Scoliosis is a complex condition and frequently requires co management with a network of health professionals. It’s this team approach, using a combination of treatment techniques and therapies that can create the best patient outcomes. We commonly work with dedicated scoliosis clinicians to review your case and ensure you receive evidence based advice, support and appropriate treatment recommendations. Our practitioners work closely with general practitioners, scoliosis clinicians and scoliosis (ScoliCare) brace providers to ensure patients get access to the latest and most evidence based treatment options. It is important to understand that not all non surgical treatments help scoliosis. If scoliosis is detected early there is better scope for treatment. There is often a small window of opportunity for non-surgical treatment to be helpful. In cases of a progressive scoliosis where rehabilitation, exercise programs and physical therapy are not considered strong enough treatments alone, cases are co-managed with certified scoliosis brace providers to ensure patients are supported every step of the way. Bracing may be recommended in conjunction with a scoliosis specific rehabilitation program. Although it is our goal to successfully treat scoliosis without surgery it is important to note that in some cases, surgery may be the best treatment option. In this situation we work with doctors and orthopaedic surgeons to ensure the best outcome. With understanding and concern, we will help turn your frustration into a more manageable situation, providing relief and support where we can. Talk to us about your scoliosis treatment now.